What does Basil Nanach mean that Rabbi Nachman "rules the universe"? This sounds, shall I say, quite scary. bravo bravo. Very funny. smile. don't stop na nach!! 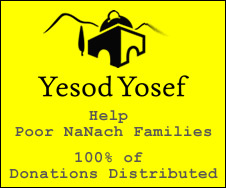 I am not questioning Rebbe Nachman's authority as Rosh Bnei Yisrael. I am just wondering what Basil Nanach meant by Nanach is about "Rebbe Nachman ruling the universe". This is the loshon we use to describe H"Y - Melech HaOlam - King of the Universe. Only H"Y can rule the universe. Even Moshe Rabbeinu was called "eved Hashem". See Talmud Sanhedrin 20b - that King Solomon reigned over all the world, Upper and Lower, the Medrash, if I recall correctly has an even more detailed accounting to King Shlomo's dominion over the entire creation. אמר הקב"ה לעולמו: עולמי עולמי מי בראך? אומר לך מי בראך, אומר לך מי יצרך, יעקב בראך, ישראל יצרך, דכתיב: בוראך יעקב ויוצרך ישראל. בהמות לא נבראו אלא בשביל יעקב, דכתיב: הנה נא בהמות אשר עשיתי עמך. שמים וארץ לא נבראו אלא בשביל יעקב. ויקם עדות ביעקב - ואין עדות אלא שמים וארץ, שנאמר: העידותי בכם היום את השמים ואת הארץ. לא נבראו שמים וארץ אלא בשביל יעקב, ששמו ישראל, שנאמר: בראשית ברא אלהים - ואין ראשית אלא ישראל, שנאמר: קדש ישראל לה' ראשית תבואתו. לא נברא הכל אלא בשביל יעקב, שנאמר: לא כאלה חלק יעקב כי יוצר הכל הוא. Honestly guys, it was meant to be taken in good humor. In the same vein that the queen is not really a Na Nach. We do not believe Rabbi Nachman is G-d.
Ok, got it. Thanks rabosai. "The Tzadik decrees and Hashem fulfills" something like that. basically Hashem is the king that gives over his kingdom to his son (The Tzadik) during his lifetime. Anyway that's the way I always thought of it. To say it another way. Rebbe Nachman is the G-dliest Tzadik around. The Tzadik is the heavenly court. The tzadik is in actuality much much much bigger then our current perception of G-d. So whatever dude. I just can't really tell the difference. Except I remember reading that Rebbe Nachman once said that he was not G-d. G-d Himself never said that. by the way while I'm commenting. I must say it again. splendid job. Keep it up. very funny and very holy video!! Saba-Noon wrote: "I just can't really tell the difference. Except I remember reading that Rebbe Nachman once said that he was not G-d. G-d Himself never said that." Now I'm confused again. I don't understand what you mean when you say you can't really tell the difference. Why would Rebbe Nachman ever have a need to say something that everybody already knows, i.e. he is not G-d? Le'havdil, there is a small group in Chabad called the Elokistim that say they can't tell the difference between H"Y and their Rebbe. I believe you are saying something different than this. But could you please clarify. I have B"H went so through all the books and hashmatos and I do not recall ever seeing this story that Sabanun just posted. sorry, just found out that that was a story about the Baal Shem Tov. Rebbe Nachman never said that He was not G-d as far as I recall.